Note: Hey there, everyone! This week’s post is, in fact, not from me at all, but a cross-post from Grace over at So Many Heartbeats, a really lovely person starting a really lovely body positivity and feminist blog. Here’s a quick taste of things to come over there, and definitely check out her site when you get the chance! I’ll be back with my own blogging later on, particularly when the madness that is working two jobs and writing a senior university honors thesis calms down just a tiny bit. There has been a lot of buzz lately of whether or not actress Jennifer Lawrence is a body-positivity heroine or its antithesis. Oddly enough, both sides of this argument cite the same interviews and YouTube videos but interpret them very differently. So, because I created this blog so I could weigh in on topics just like these, here I go. On one side, J-Law lovers boast about how Jennifer Lawrence is championing over the cruelty that is Photoshop and Hollywood, saying things like she would never lose weight for a role and that society’s ideals for women’s bodies are harmful and unattainable. 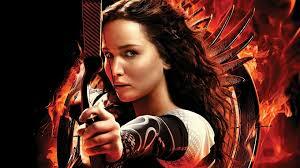 She talks about keeping her adolescent audience in mind when preparing for her role as Katniss in The Hunger Games, saying she wanted Katniss to be a strong female role model for young girls, instead of another waif of a woman whose main goal is to “get the guy” at the end of the film. Cool. I’m all about women speaking out and standing up for their bodies regardless of how they look. I’m all about questioning ideals. I’m all about strong female protagonists in films that pass the Bechdel test with flying colors. But as soon as Jennifer Lawrence’s fans flooded Tumblr in her honor, a whole stream of bloggers emerged saying, “Hold up, your fave is problematic.” Like I did with the first side of the argument, I read their evidence with an open and curious mind. Yes, Jennifer Lawrence did say a pretty trans-phobic statement during an interview with Ellen DeGeneres. Yes, she did kind of say that eating disorders are “dumb” rather than serious mental illnesses (which, I admit, really hurt me personally. We didn’t choose to have disordered eating, and we certainly should not be blamed or labeled as “dumb” for our struggles). Yes, Jennifer Lawrence is still an attractive, white woman. Despite not being the Hollywood size 0, she still generally fits into a mold of being presentable to society. This is where my opinion of Jennifer Lawrence starts to deviate from this line of thinking. The “What does she know about being a fat and unattractive woman in America?” is thin-shaming and has no role in my body positive movement.Thin-shaming and fat-shaming are two sides of the same coin; both objectify women and deem them incapable of cultivating their own opinions and having their own independent experiences regardless of how they look. There’s actually no difference is saying that Jennifer Lawrence can’t talk about body acceptance because she’s not a size 16 and saying that Melissa McCarthy can’t talk about her favorite vegetable stew because she is. [Note: I have absolutely no idea what size Melissa McCarthy is, nor do I care.] You see? Body-shaming is body-shaming, objectification is objectification. Reducing women to their outward appearances and denying the fact that they– gasp!— are capable of producing independent thought contributes to the continued oppression of women worldwide. So now, I’m throwing my own argument into the mix. Can we stop idealizing Jennifer Lawrence into being a perfect role model? Can we let go of the idea that “perfect” even exists? Can we stop thin-shaming her into submission by nitpicking every word that comes out of her mouth? Can we recognize that she is just another human being who is brave enough to share her unpopular opinions, but will also make some insensitive comments sometimes, as we all inevitably do? Can we all just relax about Jennifer Lawrence? The constant pressure placed on our bodies day in and day out can make you never want to leave your bed, where at least your pillow understands that your body is nobody’s business but your own. But much as I’d like to, I can’t stay in bed for my entire life and listen to body negativity pitter-patter against the roof like a particularly noxious rainstorm. So forgive this somewhat-ranty list of the top six things that irritate me about the way body politics appear in the world and the media today. 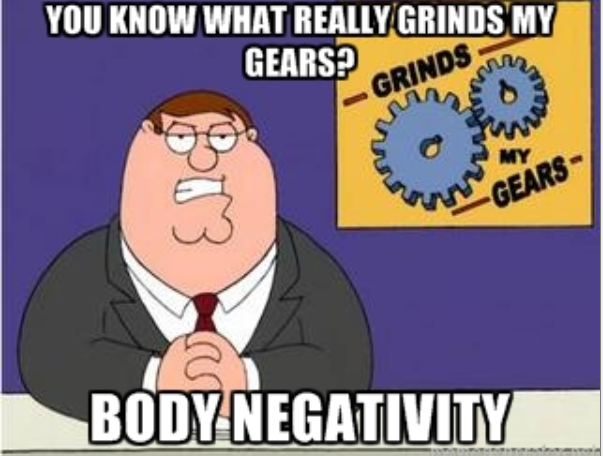 If I miss something that really grinds your gears, let me know in the comments! This list could go on forever, but I only have so much emotional energy to expend at one time. Plus what? Plus society’s preconceived notion of what size is acceptable for a woman? Here’s my general thought on the matter: “plus” means positive, as in “not a negative number.” We are all plus-sizes if we take up any space at all in the world. So please stop dividing clothing into “acceptable” and “plus-acceptable.” If you have to make clothing sized by numbers, go ahead and do that. Just keep your value judgments out of it. 2. 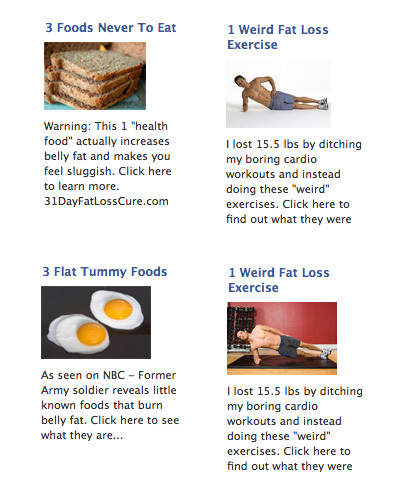 Diet supplement and weight-loss ads everywhere. I’ve made a game of it every time an ad telling me I can LOSE SEVEN INCHES IN TWO WEEKS WITH THIS ONE EASY PILL, NO DIET OR EXERCISE REQUIRED!! (For some reason or other, they do seem to enjoy caps lock…) I like to block them, and then when Facebook politely asks me why, explain that they are “against my beliefs.” Which they are. I’d just like to see the article my friend posted on my wall about the French kids who took a llama on the tram. I don’t want to be bombarded with the multi-billion-dollar diet industry. Facebook doesn’t know my body. And quite frankly, it’s none of its business. First off, tabloid reporters have zero way of knowing whether or not one of these celebrities is or is not struggling with an eating disorder. That’s not something that you can tell by picking them out on the street. Eating disorders are mental illnesses (I’ve discussed this before…), not diet plans. And making it something you have to continuously deny only adds to the shame. 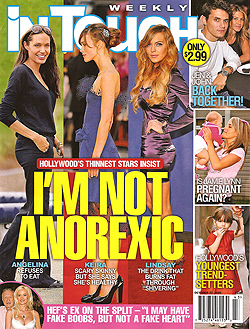 The last thing we need is celebrities having to repeatedly assert “I’M NOT ANOREXIC!”, as this only heightens the stigma on an already dangerous disease. And let’s not even talk about those little arrows on the left image, pointing out Mary-Kate’s “stick thin legs!” Because that’s so helpful, Star. No. No no no no no no. Other people’s bodies are literally none of your business. Cellulite is not like Sugar Ray Leonard, and you cannot “lose a fight with it.” Cher “packs on 26 pounds,” and that’s entirely her business. Please stop making other people’s body size news. You want to show me “eight pages of shocking new photos”? How about some pictures of the cleanup efforts around Hurricane Sandy, or the continuing conflict in Syria. Not Britney Spears’ thighs. The only person to whom Britney Spears’ thighs are important is Britney Spears. And I doubt she’s reading this magazine to find out what they look like. Mocking someone for lazy and slothful behavior is one of the best ways to motivate them to change and appear more pleasing before our presence… Hurting people’s feelings is the quickest way to get them to change… We have decided as a group that fat shaming is essential in creating a society of thin, beautiful women who are ashamed for being ugly. Let the fat shaming begin! I’m actually so angry about this that I want to throw my computer across the room and let out a war cry. I won’t do that, because 1. my laptop is very expensive, and I’m unemployed, and 2. I’m in a public library and that would be frowned upon. But seriously? This is the world I live in? I don’t think I actually need to say what’s wrong with this, but let’s do it briefly anyway. Second: Some people still seem to be laboring under the delusion that women are here to “appear more pleasing before men’s presence.” Excuse me while I laugh so hard that I actually vomit up a lung. Third: “Lazy and slothful behavior” are not direct causes for someone’s body type. Fat does not equal unhealthy. Thin does not equal healthy. Neither of these equal beautiful. Besides failing basic human decency, it appears that someone also failed science. If you haven’t seen the 37-second video that explains why Photoshop gives us an unrealistic view of what the actual human body is supposed to look like, I recommend you click on this link and check it out. You can spare 37 seconds to see in glittering detail how fashion magazines and advertisements are airbrushing us out of existence. If you want to sell us clothing and accessories, please show us how it would really look on an actual human’s body, not on some computer-generated cyborg that you whipped up in your laboratory. I don’t want to see what pants will look like on someone made of toothpicks and papier-mâché, I want to know what they would look like on me. Because unless I’m very much mistaken, the average consumer is, in fact, human. The only plus side of Photoshop in the fashion and advertising industry? The fails. 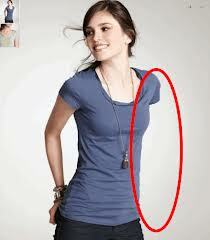 Photoshop fails make my day. I could go on for days and days and days, but as I mentioned earlier, that would only result in me breaking things. Is it possible to live in a society where women’s bodies aren’t placed on the dissecting table and picked apart by strangers and CEO’s? Maybe not today, maybe not tomorrow. But I live in eternal hope that someday I will turn on my computer, switch on the TV, and flip through a magazine without once feeling the need to flip a table. Hey, all! After a fantastic trip to Northern Ireland, I’m back in my home base, catching up on sleep and wondering why driving on the right side of the road has suddenly become so difficult. On the plus side, this means that I’ll be able to get back into my more typical schedule of posting. Exciting times! Today’s topic is a little more abstract and general than usual, but I still think it’s really important to think about. How do you respond to people who disagree with you about body positivity? I can’t tell you how many times I’ve had to repeat the same three or four arguments in favor of self-love and health at every size. Even in the past two weeks, I need more than the fingers on both hands. While body positivity is a very personal journey, many people have a hard time understanding what it’s all about, or why it’s really not any of their business how I feel about my body. I sometimes have a difficult time not flying off the handle when confronted by people who are completely against all the principles of positive body image that I work for. I find myself tempted to build a soapbox out of whatever materials I happen to have at hand, climb up on it, and wave my hands around while shouting for about a quarter of an hour. But this won’t accomplish anything. And that’s why I’m compiling this list: Five Ways To Talk To People Against Body Acceptance Without Making Enemies. It’s not the catchiest name you’ve ever read, but it’s still a useful list to have on hand when someone confronts you about your beliefs. Because if it hasn’t happened yet, it’s probably only a matter of time. Often, the only reason someone is so vehemently against you is that society pushes the opposite message of the body-positive community. It’s not fair to target others because they haven’t been exposed to the viewpoints that we’re dealing with. If they’re willing to listen to you and hear your reasoning behind your beliefs, that’s great. But think about it this way: you have someone in front of you that can potentially be persuaded to change their perception of the body-positive community and respect people of any size, shape, color, or what have you. Don’t throw that opportunity away by going off on a rant. A recent conversation I had with a total stranger (that’s what happens when you put me on an eight-hour flight, I get into discussions about body positivity with my seatmate) evolved into the motivating factor for compiling this list. He shared his distaste for dating women he deemed “overweight,” because living a healthy lifestyle was important to him, and he was worried that dating a heavier woman would compromise his goals. There were plenty of things I wanted to tell the man in 26F, not least of all that weight and health are not the same thing, or that what a woman does with her body does not need to impact what he does with his. But lecturing him would get me nowhere, and would make me look like a jerk. I’m neither, by the way, but by looking at my weight alone, it’s tough to tell. The best part of questions is that they force the audience to think for themselves without making them feel attacked. It’s the same as the old “I-feel” statements: you’re allowed to express how you feel without ganging up on your conversation partner. Which I’m sure they appreciate. 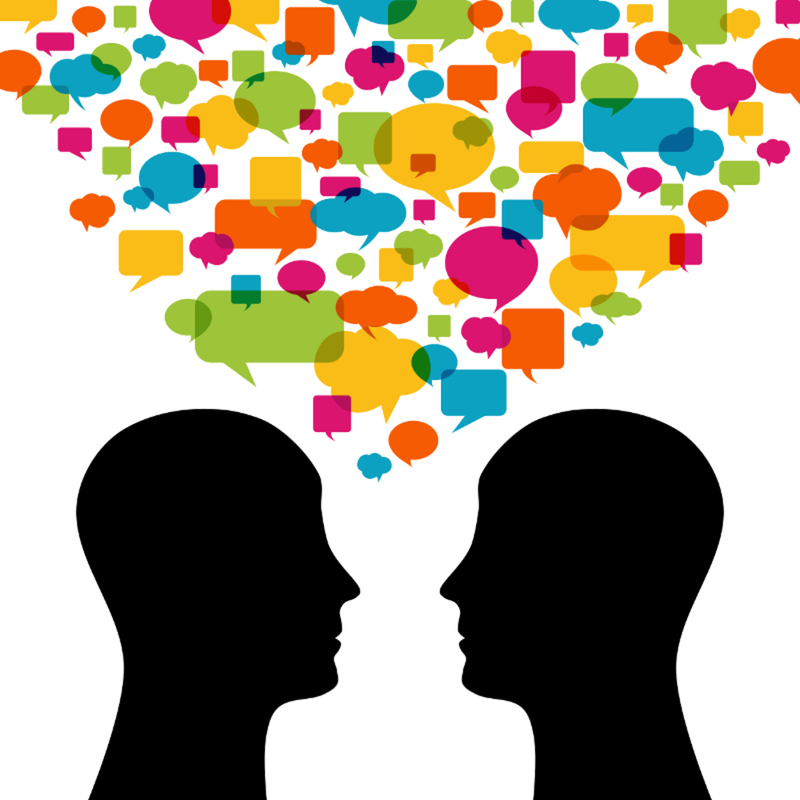 Too many arguments get derailed because they descend into finger-pointing and name-calling. Calling each other rude names isn’t going to convince anyone that body positivity is a good thing for society. But you know what might? Facts. Too often, the “War On Obesity” or the Sedentary Age of America gets blown up into emotional appeals and exaggerations. When obesity has become not only a disease but an epidemic, it’s tough to get people to take a step back and think critically about what they’ve been told. Debate Team 101: it’s easier to be persuasive with facts rather than opinions. This tactic appears all over the consciousness-raising sphere, from educating people about sexism, racism, homophobia, or what have you. If you’re talking to someone who’s never considered the idea that fat discrimination or society’s pressures on our bodies and our health habits are serious problems, leaping into a discussion of complicated particulars on the subject is not going to be helpful. Everyone has been exposed to some kind of body pressure, whether or not they think they have. Been teased for being the scrawny kid who got picked last for dodgeball? Anxious because you’re shorter than your girlfriend? Feeling uncomfortable because your significant other expects you to look like either David Beckham or Kate Moss? You’ve experienced body pressure. How did it make you feel? Trust me, you’re not the only one who feels that way. It would be great to think that with enough reasonable conversation and awareness about the serious problems around body image, social pressures, and body type discrimination, we could change everybody’s mind in the whole world. It would also be great to have a pony and a billion dollars. There are some people who disagree with you simply to get a rise out of you. Sometimes it’s patronizing, sometimes it’s rude, sometimes there’s a “it’s for your own good!” note to it. Either way, know that there are some battles you’re not going to win. 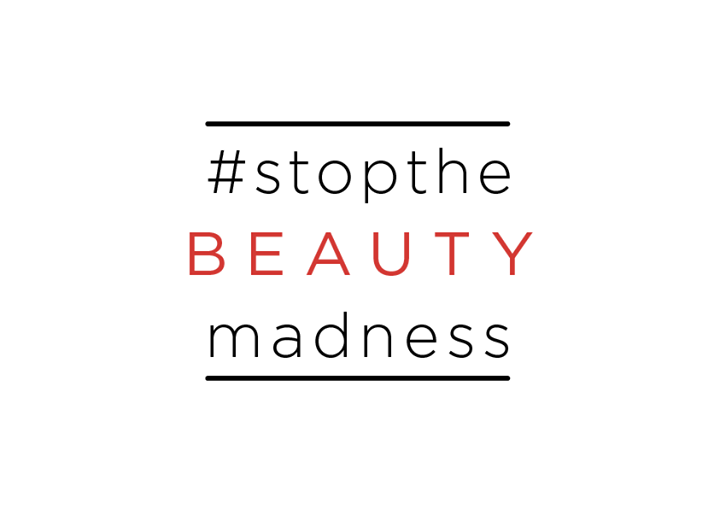 This is a big issue, and it will take more than one conversation to change everybody else’s mind. There’s no call to expose yourself to verbal abuse when it’s clear you’re making no progress. That’s what the “block” function on blogs is for. And that’s what legs are for: to walk away. What do you think? Are there any other suggestions you’d give to people trying to explain their body-positive position to others? Anything I’ve suggested that you don’t think will work? Let me know! Note: this post appeared this morning on the fabulous blog The Outlier Collective, which invites two bloggers weekly to engage in often controversial topics from various perspectives. You should definitely check that blog out (the editors are lovely, lovely people), and the post can be found in its original context here. And thanks again to MadameWeebles for inviting me to write a guest post – you should all definitely check out her site as well! My hand stopped halfway to my mouth, the thick, crispy, delicious french fry left hovering halfway between me and my plate. My friends around the pub table continued eating, and I sighed. Here we go again. That’s the trouble trying to have a social life while in recovery from an eating disorder: sometimes you forget just how much of our culture revolves around food. We bond by going out to eat, out for drinks, out for ice cream, out for popcorn at the movies. What I’m noticing, though, is that as women, we’re encouraged to bond around not eating. I’m not talking about pro-ana groups specifically, though I’ll argue with my last breath that they’re a more dramatic manifestation of the same impulse. All I’m saying is that it’s easy to bond over shared problems, and the common denominator of personal malaise for the modern woman tends to be the size of our bodies. Diet culture is not only a cash cow for mail-order food programs, it’s a great way to build community. Think about all those throwaway phrases you and I have used while out with friends. Speaking in huge, broad generalizations, we are bonding over an association between food and feelings of shame and self-loathing. As if there were something morally heinous about ordering the giant beef burrito you’ve been daydreaming about for days. As if an ice cream sundae had the power to transform you into the Antichrist. As if the food you put into our body says anything about the quality of the character you carry around in it. Eating can be a source of pleasure and enjoyment, but in the end it’s the shame as shoveling coal into a steam ship. Everybody does it. It keeps us moving, and when we stop doing it, or don’t do it often enough, we sink. Simple as that. And if sometimes you can make your coal-shoveling a little more exciting, and do it around a table with friends and ambient lighting, why on Earth wouldn’t you? The reasons for why we wouldn’t are endless. Pop culture and the media telling us we need to be waif-thin and order salads with dressing on the side, otherwise we’re worthless and unlovable. Doctors and the American Medical Association telling us that obesity is a disease, and it’s contagious by simply looking at a plate of churros (I exaggerate, but only slightly). Well-meaning family members and friends looking us up and down, commenting on our bodies like we’re public property, and if we don’t look a certain way we’re on the fast track to death or old-maid-hood or some other horrific fate like being left on the side of the ballroom while Mr. Darcy dances with someone else. Or simply the voices in our head, telling us that if we eat what we really want, if we don’t behave like the perfect mental construct of what a woman should be, we are in some way less than, imperfect, failures. Those voices are more difficult to ignore than any of us like to admit. 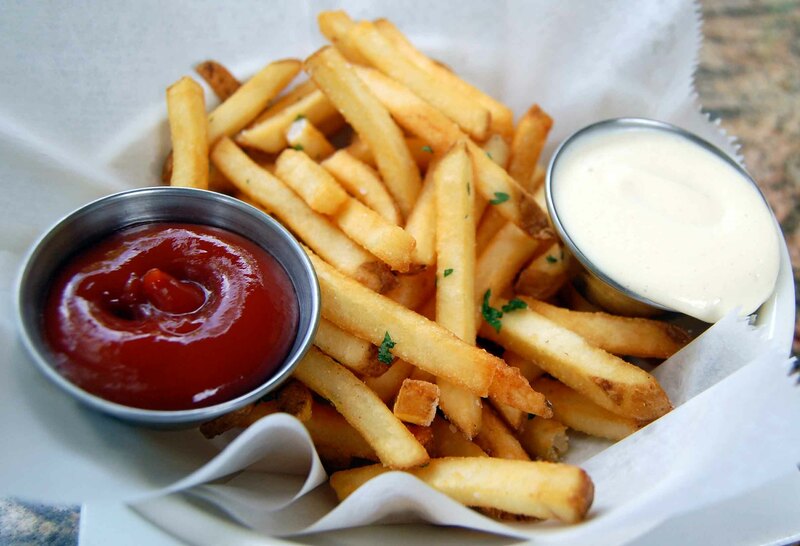 Time was, the question around my nearly-eaten french fry would never have been asked, because you couldn’t have gotten me near a plate of fried, salty potatoes with a ten-foot pole. Which is a shame, because this was one of the most delicious meals I have ever eaten. It was a dinner of salty delicious chips, a pint of Guinness, and a bowl of soup that may or may not have included octopus tentacles. And you know why? Because while I still have moments where I hem and haw and panic over the moral consequences of a plate of pasta, in the end, I’m starting to relearn that food is food. And if I only end up in this pub once in my whole life, am I going to be proud of myself for bypassing the chips and the octopus for a chicken Caesar salad, dressing on the side, while staring longingly at my friends’ meals?